Have you ever wondered what it’s like to work inside a chicken processing plant? A recent request by the National Chicken Council (NCC) and Republican lawmakers asking the USDA to require employees to increase the speed they kill chickens (also known as the birds per minute or BPM rate) has drawn increased attention on working conditions. Dr. Celeste Monforton worked for the U.S. Labor Department in the Occupational Safety and Health Administration where she was policy advisory and chief of staff to the Assistant Secretary. She is an advocate for worker protections and a professioral lecturer at George Washington University. Dr. Monforton has interviewed many of the people who work inside these factories in order to advocate for worker protections. She agreed to a phone interview as a part of series of articles I’m writing on animal agriculture’s recent efforts to increase the BPM kill rate which poses additional risks to workers’ health and safety and animal welfare. Kirschner’s Korner (KK): What are the risks of increasing the BPM kill rate? Dr. Celeste Monforton (CM): Working in poultry plants is already a dangerous job. Think about putting yourself on an assembly line; temperature 40 degrees and damp, wet and slimy, animal and body fluids and fats, slippery conditions, while processing 140 birds per minute. Workers are arm to arm working with sharp tools, knives, and hooks. They’re given one particular task to do and must repeat it over and over again (e.g. lift left wing and cut it, repeat). They’re using the same muscle groups and tendons for hours on end which puts a strain on those body parts. KK: How do injury rates compare in other industries? CM: Poultry plants have some of the highest rates of injuries from lacerations and amputations. Employees are at particular risks from pathogens on the chickens. The lacerations are not just from the cutting tools but from sharp chicken bones. Because of the pathogens on the chicken carcasses and because the companies are processing so many birds, in order to try to reduce the number of pathogens, the plants have massive vats of liquid with disinfectants to soak the chicken carcasses. The plants also have sprays over the conveyor belts that continuously spray anti-microbial agents to keep the pathogens at bay. Workers wind up inhaling the mist from that spray. It’s dangerous and unhealthy work. KK: How do those chemicals affect employees? CM: The chemicals are strong respiratory irritants which is particularly problematic for poultry workers who have respiratory diseases. These agents are acidic and corrosive. Workers most often complain of burning eyes and the chemicals can exacerbate respiratory problems. KK: What happens if employees take time off from the line to address their health issues? CM: Workers are under pressure to work as fast as possible. All of the live chickens must be processed by the end of each day. If someone doesn’t show up for work, all of the chickens must still be killed and processed by the end of the day so there’s intense pressure to work faster to pick up the slack. Workers are often not permitted to step away from the line to use the bathroom. They have to raise their hand to notify a manager that they need to use the bathroom. A “floater” is supposed to be available to step in for the worker when he or she steps away but many workers report floaters are unavailable. Workers say they have to wait more than an hour to use the restroom when they need it. Women workers report that on their lunch break, because everyone gets off the line at the same time, the lines are too long to get to use the bathroom during their 30 minute lunch. KK: What happens when employees can’t use the restroom? CM: Workers have reported defecating and urinating on themselves when they are not given access to the bathroom. Pregnant women and other workers describe getting urinary tract infections. It is likely related to workers limiting their fluid intake because they know they won’t be able to use the bathroom. KK: What happens when workers are injured? CM: The companies typically have nurses stations often staffed by EMTs or a nurse who are trained to provide first aid. Workers often report the treatment they receive is insufficient for certain types of injuries. Workers who have symptoms of muscle strains, carpal tunnel syndrome, and tendonitis are given Advil and a warm compress. They will stay in the nurse’s station for a little while and then are sent back. OSHA has documented examples of workers going to nurses’ stations for the same problem dozens of times. KK: What are the companies doing, if anything, to address this problem? CM: The companies aren’t getting to the root of the problem which is the fast line speeds and the nature of the work. Workers are suffering from disabling musculoskeletal disorders and being exposed to the same hazard makes their conditions worse. When workers develop these disorders, they are often denied proper medical care. Companies often question the cause and make allegations the worker must be doing something at home to cause the problem. If workers are sick and have to stay home (many don’t receive sick leave) or stay in the bathroom too long, they’re given penalty points. The penalty system is intentionally mysterious so workers don’t know how many points they have or for what reason. It’s a way the companies can weed out workers who speak up about safety or poor working conditions. KK: What are some of the food contamination concerns? CM: There are high concentrations of salmonella which reside naturally in the gut of chickens and it’s excreted in feces. Inside and out, live chickens carry salmonella. Chicken carcasses are decontaminated in vats of anti-microbial agent but when workers gut the chickens and open the viscera, the process can be recontaminated with those pathogens. When the BPM rate increases, health risks also increase as it becomes more difficult to ensure the process controls are maintained to reduce pathogen contamination. KK: What can people do to stop the USDA from approving the NCC’s request to increase the number of birds killed per minutes from 140 to 170 or no limit? CM: I recently participated in a meeting with the USDA. The agency stated they’re currently evaluating the industry’s petition but have not yet rendered a decision. They stated they have received phone calls and letters from people opposed to increasing the BPM. The USDA opened a docket for people to submit their opinions which they will factor into their decision. Action Alert! Take a Stand for Human and Animal Rights! The USDA is currently accepting public feedback on the line speed request. Click here for the link and click “Comment Now” to register a comment on the NCC’s petition line speed request. When I posted my comment, there were only 10 comments submitted thus far. Every comment counts. Thank you! Thank you for participating and for spreading the word about these incomprehensible acts. I have added my comment and will publish this information on my blog as well. Outstanding. Thank you Bill. Greatly appreciated. 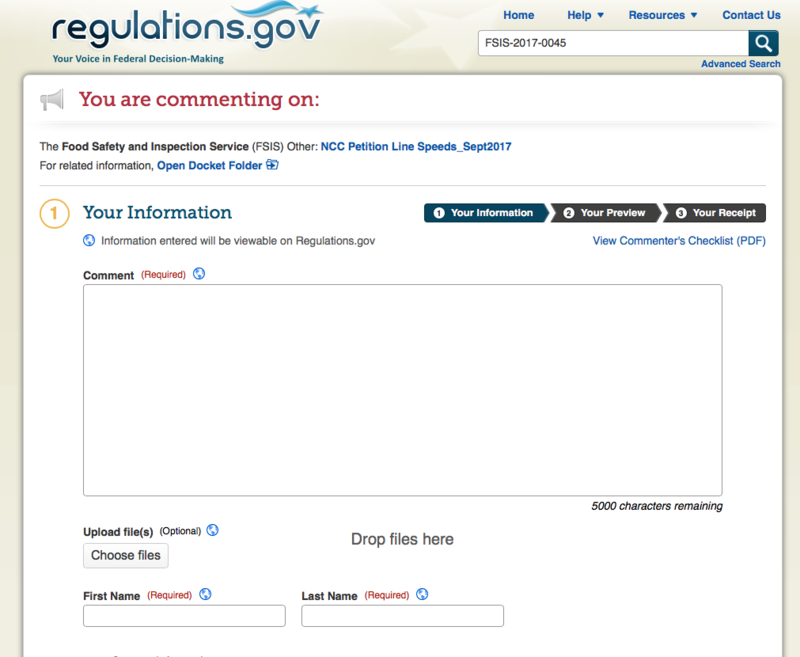 At last check, there were only 20 comments on the USDA site on this regulation. I’m hopeful before the 30 day period to post comments expires, there are thousands of comments in opposition to it from human rights, environmental, and animal advocates. A world moving toward veganism is the most logical solution – it will be gradual, but people like Bill Gates are betting on it being a reality by 2050. Well said Ellen. A win for animals, people, and the planet. Andrew, I couldn’t the document to load. I waited fifteen minutes while it kept saying, “loading” until I finally gave up. Any suggestions? Thank you for your interest. Try clearing your history and restarting your computer. Also, if you subscribe, you can receive all of my articles via email. It’s free and contains no ads, of course. Hi, I love your website and your articles. As a vegan and animal lover for 18 years, I appreciate the topics & issues that you talk about. I have a question which might be interesting for you to do an article on, because of your unique perspective on the current state of affairs in our country. Here’s my question: It’s widely known that Pres. Donald Trump is mentally unstable. Isn’t this a valid reason for his impeachment? Like many Americans, I wonder why Pres. Donald Trump hasn’t been impeached by now. I realize that it may be because Americans don’t know how to deal with a person who is mentally unstable. The average American response is usually to ignore people with mental instability, because we either feel uncomfortable around it, or have little idea how to respond to people with this condition. A good example can be seen, by how we ignore the vast number of homeless people that live on the street who are mentally unstable. Having a President who is mentally unstable is unsafe for everyone in the country. Children are being exposed to a role model who sends mixed messages of confusion. What do you think? Thank you for your kind note. I appreciate your support and advocacy. Many authors have already written about the topic you’ve raised. If you Google it, you’ll find plenty of articles from experts in the field of mental health and government. Thank you for the suggestion!